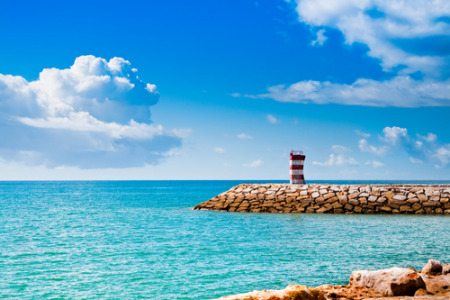 Quarteira holidays take you to a one-time fishing village, west of Faro, on the sunny Algarve coast of Portugal. The resort is one of the earliest tourist developments here and, as little thought was given to aesthetics, the village is now surrounded by high rise hotels and apartments. Holidays to Quarteira can be taken at any time of year as the resort enjoys long, hot summers and mild winters. The busiest months are from April until October with temperatures rising from mid-twenties to low thirties at the height of the season. Holidays in Quarteira have wide appeal and families, water sport enthusiasts, golfers and couples of all ages flock to its shores. The vibrant nightlife also attracts groups of young singles. We have a surprising number of cheap Quarteira holidays that are considered great value as our commitment to quality and service never wavers. With tall cliffs sheltering swathes of soft, golden sand, it comes as no surprise that our low cost Quarteira holidays are snapped up by families. Care must be taken with children as the waves can at times be heavy and there are strong currents. However, the conditions here are ideal for water sports including surfing, skiing and sailing. Our bargain Quarteira holidays can be as relaxed or as active as you wish as there is a host of recreational pursuits and recreational facilities in the vicinity. Golfers have a choice of courses and there is a water park offering fun and excitement for all the family. If you are seeking respite from inclement weather in a lively resort, our Quarteira holiday offers may be just the ticket. For further information and to view our best Quarteira holiday deals, please use the search facility.